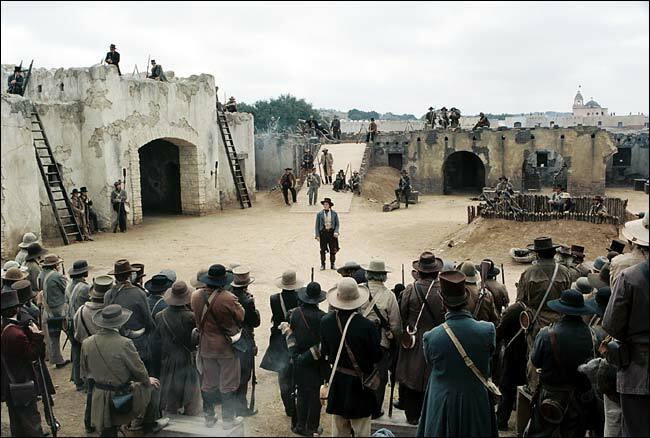 An earnest retelling of the seminal siege during the Texas Revolution, The Alamo is a character-rich war film, proudly raising the flag for realism and looking for the genuine hearts behind the facade of heroism. It's the mid 1830s, and the Texas Revolution is in full swing. American settlers have driven the Mexican army out of Texas, but Mexico's President Santa Anna (Emilio Echevarría) is himself leading an army of 1,500 men to reclaim lost ground. His destination is the Alamo in the town of San Antonio de Bexar, a former church mission and now a semi-fortified compound. 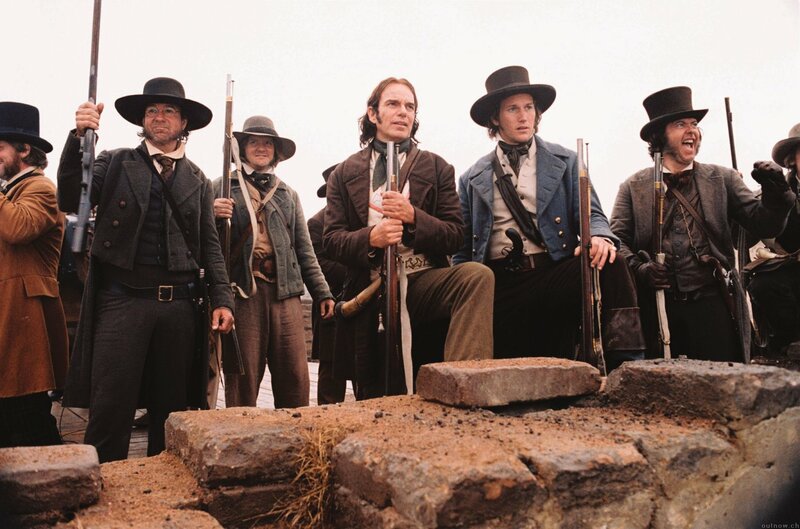 The prominent Americans in the area include politician and military commander Sam Houston (Dennis Quaid), Lieutenant Colonel William Barret Travis (Patrick Wilson) of the fledgling Texas Army, and adventurer James Bowie (Jason Patric) in command of a band of militiamen. After clashing over leadership, Travis and Bowie lead their men to the Alamo with the intention of defending it and repulsing the Mexicans long enough for Houston to raise reinforcements and rush to the rescue. Further to a political election defeat, congressman and celebrated frontiersman Davy Crockett (Billy Bob Thornton) also arrives in Texas, and joins the defenders. In total, around 200 Texians occupy the compound and attempt to fortify it against attack. But Santa Anna arrives sooner than expected and a siege begins, the small number of defenders hunkering down to withstand daily canon bombardments, hoping for reinforcements as they await a decisive Mexican assault. The Alamo maintains a welcome focus on authenticity, all but eliminating any jingoistic elements to the famous last stand. By chasing the facts and eschewing legendary embellishments, director John Lee Hancock (replacing Ron Howard further to creative differences besetting the production) switches the focus to the key characters, and finds in each of them the combination of skills and flaws needed to create real people. The Alamo succeeds precisely because it moves away from mindless heroism and seeks a story of normal men accepting an extraordinary challenge. In pursuit of down-to-earthiness, The Alamo understandably endures a slow build-up. The pace is deliberate and unhurried as many characters are introduced and provided with a background and a narrative that places them at the Alamo at a crossroads in Texas history. Davy Crockett, James Bowie and William Travis are the most prominent, and Hancock emphasizes the dynamic between the men, particularly the tension between the young and inexperienced Travis and the overconfident but coarse Bowie. Crockett is presented as wise and weary, now much more of a politician than a wilderness warrior, but still in command of the quiet leadership skills needed to inspire men to action. 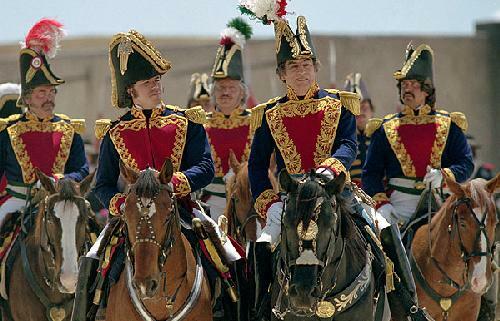 Santa Anna and his army also receive plenty of build-up as they assemble to reclaim Mexico's honour, and the decision to film these scenes in Spanish adds to the film's drive for authenticity, but the absence of subtitles is an unfortunate omission. When the shooting finally starts, the action picks up, but the emphasis remains on the men's reaction to the exchange of hostilities rather than the fighting itself. Only with the final assault does Hancock switch to an all-out war movie, and The Alamo delivers an excellent recreation of the climactic battle. The denouement, as represented by Houston's scraggly retreat (known as the Runaway Scrape) and subsequent counterpunch, places the sacrifice at the Alamo in its proper historical context. The performances are solid without being spectacular, Quaid perhaps too dour as Houston while Billy Bob Thornton enjoys the most engaging role of Crockett, a nuanced blend of resignation and inspiration. Jason Patric and Patrick Wilson bounce off each other as their characters clash often, and while both actors offer depth and shine in moments, they are overshadowed by Thornton and the increasing momentum of the siege story. The Alamo is respectful salute to the famous battle, allowing the event to garner its own power with minimal hyperbolic intervention.